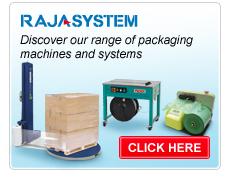 Rajapack offers a range of packaging machines to help you work more efficiently. You can get stretch wrapping equipment to cover products and pallets faster, as well as heat sealers and strapping machines to speed up your warehouse processes. And if you need to protect products in storage and transit, our void fill machines could really save you time. All our packaging machines come with a warranty, so you can buy with confidence. And because we understand that budgets are tight, our void fill machines are available to hire – this means you won’t have to make a big investment, and you’ll also get FREE delivery and installation, as well as full after care support. Our machine specialist can help you find the best solutions for your business.